Washington, DC — Property of the People, in partnership with ProPublica, published a searchable online database of 8,807 records today comprising meeting logs and calendar entries for five White House offices. In a move roundly criticized by journalists and transparency groups, on April 14th, 2017, the Trump administration announced it was abandoning the Obama-era policy of making White House visitor logs open for public inspection. Seeking to restore public access to these crucial records, the Washington, D.C.-based transparency organization Property of the People filed Freedom of Information Act (FOIA) requests with numerous White House offices, and filed suit against some of these offices for failure to comply with the group’s requests. As a result, Property of the People obtained large portions of these White House visitor logs and calendars. 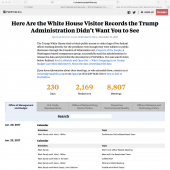 In a publishing and development partnership with ProPublica, a searchable database containing 8,807 entries from these White House visitor logs and calendars was created for journalists and concerned citizens. The release contains entries spanning January 20, 2017 to September 6, 2017, which represent a large portion of the meetings taken by the White House’s executive Office of Management and Budget (OMB), Council on Environmental Quality (CEQ), Office of National Drug Control Policy (ONDCP), Office of Science and Technology Policy (OSTP), and the Office of the United States Trade Representative (USTR). Just one of hundreds of pages of hand written visitors logs Property of the People obtained from the executive office of the United States Trade Representative (USTR). 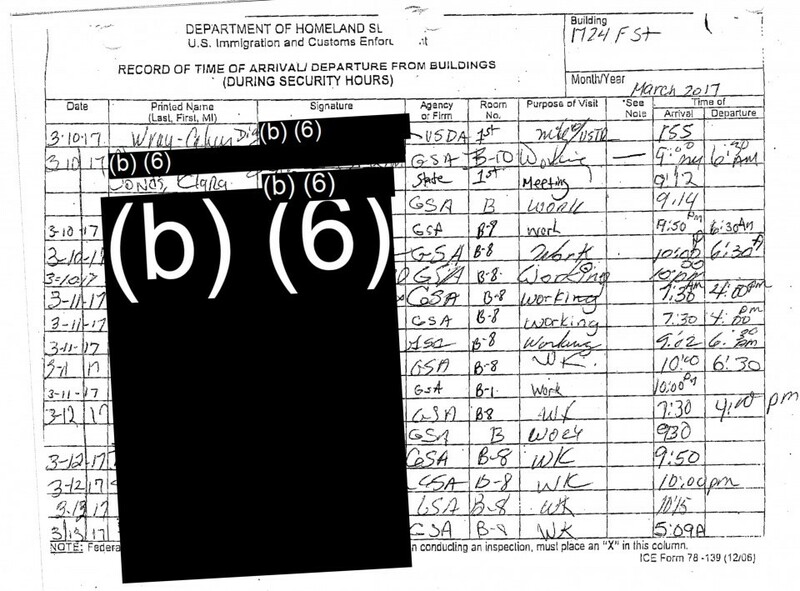 ProPublica worked to digitize these records and thousands of others to forensically reconstruct the bulk of Trump’s White House visitor logs. A searchable database of the records is available via ProPublica HERE. Within these records are revelations both small and large. Today ProPublica leads with reporting based on the released documents that upon arrival at OMB director Mick Mulvaney’s calendar quickly became a who’s who black book of corporate and conservative interests — a selection includes casino magnate and friend of the president, Steve Wynn; representatives of the ultra-conservative Heritage Foundation; Wall Street and health CEOs; Koch Industries lobbyists; a Russian cryptocurrency evangelist; and a prominent member of the right wing Catholic organization Opus Dei. Thanks to the tireless efforts of ProPublica, over 8,807 White House Complex meeting records are now available for public inspection. The searchable database of White House records is available via ProPublica’s website HERE. Moving forward, new White House visitor logs and calendar entries will be added to the database as they are obtained by Property of the People via the organization’s continuing Freedom of Information Act requests and lawsuits. Ryan Shapiro is a PhD candidate at MIT and co-founder of Property of the People. Politico has called Shapiro “a FOIA guru at the Massachusetts Institute of Technology.” Shapiro is an historian of national security, the policing of dissent, and governmental transparency. Shapiro’s pathbreaking FOIA work has already led the FBI to declare his MIT dissertation research a threat to national security. Shapiro is on twitter @_rshapiro. Tagged donald trump, FOIA, Heritage Foundation, koch industries, Mick Mulvaney, operation 45, Property of the People, ProPublica, ryan shapiro, Steve Wynn, white house visitor logs.